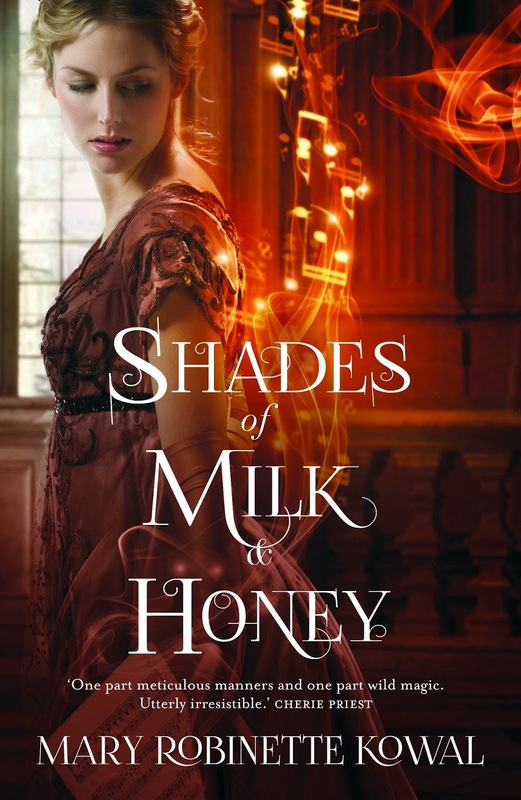 Initially Shades of Milk and Honey caught my attention with it's beautiful cover and curious blurb, 'The fantasy novel you've always wished Jane Austen had written'? As a Jane Austen fan I knew I had to read it. And after starting the book it didn't take me very long to realize how true that statement had been. Shades of Milk and Honey reads, feels, and is every inch something I could see Jane Austen herself penning if she'd ever had the inkling to write a fantasy. Mary Robert Kowal does a great job of capturing the time period and language of of the late 18th and early 19th century. Her writing is beautiful and the story flows in the general shape of an Austen novel. One of the things that the author does in this book is keep it very clean there is little to no profanity and absolutely no explicit content of any kind. This makes it a safe read for the young, old, and anyone in between. The story itself was very well written. I tend to really enjoy books written in this time period so it's no wonder that I loved each of the little secrets that were revealed and I enjoyed getting to see each of the characters grow and change through the story as well. Mary Robert Kowal's pacing kept me interested even in places where the story could have stalled or at least grown stale. And by the end it had picked up to such a pace that I felt like I was reading as fast as Jane was riding to catch up to her family. All of Kowal's characters shine in their own way and for different reasons. She does an excellent job of really making each character feel fleshed out even if they have very little time in the story. Jane and her sister Melody stood out to me in the way their relationship played out. It wasn't the perfect relationship I sometimes come across in books, and it wasn't a constantly stormy one like I encounter in others. It had it's ups and it's downs like any sisters would. Jane herself stood out to me because she had flaws and readily stated that she did, she also often acted out of jealously and love. Her character felt the truest to me of all of the wonderful characters populating Shades of Milk and Honey. Vincent however came off a little odd to me, he just didn't pull my attention like many male leads do. That's not to say I didn't enjoy his character, I did. I just felt like he could have been a little more in the story, but I believe that will be rectified in later books. Kowal's incorporation of glamour into the story is done in such a way that I felt like I'd always lived life with people around me able to manipulate glamour. She didn't waste time explaining it or trying to get readers to understand exactly how it worked she simply wove it into the story naturally. While glamour played a large part in the story I don't think it did it in such a way that would alienate readers who are either not familiar with fantasy or don't care for it. Shades of Milk and Honey turned out to be a wonderful find for me, and I am eager to read the rest of this sure to be astounding series. I'd recommended it to Jane Austen fans and fantasy fans alike. I hope you all enjoy it as much as I did.